Ruh roh! Hackers from outer space. This hacker is furious because he wasn’t cast in Lord of the Rings. He appears to be some kind of skeleton robot, and he calls himself “the Grim Hacker.” If this is the future of hacking, be afraid, very afraid! This hacker from the future is also quite creepy. He was originally a cute Jawa, but he went bad after the Ewoks were invented. Who can blame him? They start so young these days! Here’s one of the next generation of hackers. He makes his parents proud! This is the Internet of Things gone bad — very bad. People worry about hackers breaking into things, such as hacking your child’s Internet-connected teddy bear. But the future is far scarier. The teddy bears of the future — created with artificial intelligence — will grow bored playing with your kid. These bears will turn to hacking. Now imagine him with an Internet connection! I know I’m giving you the creeps, but the hackers of the future still have nothing on the present. This guy is one of the creepiest hackers I’ve seen. This hacker has got it all — a cyclops-cyborg with matrix face and laser eye. Watch out for this guy! This is a hacker from the present-day, using very sophisticated cutting-edge hacking techniques. Hackers using computers is so old-fashioned these days. . . . 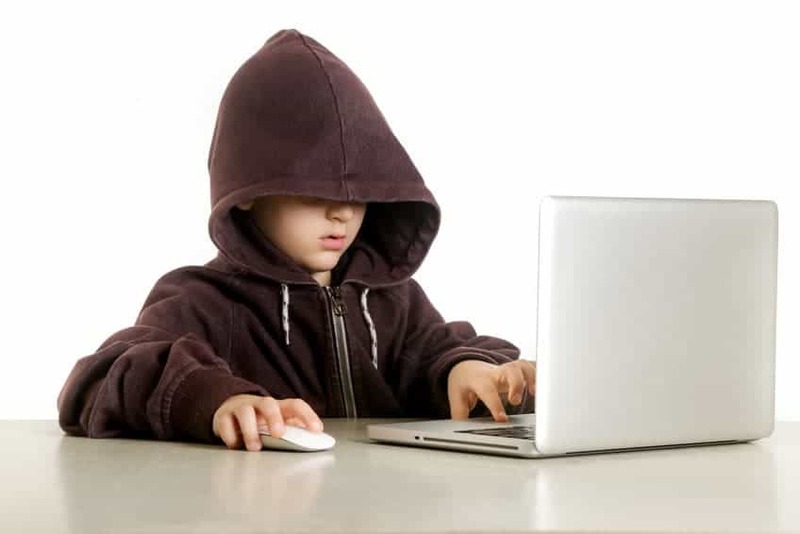 But the caption for this stock photo states: “Young hacker hacking into computer at night.” I am confused. This hacker is rightfully interested in what is in all those blue binders. They all look identical, with no titles on them, so I’m sure he’s very curious what’s in each one. Note that there is one green binder. Did they run out of blue ones? This one is called “Hacker at work.” I think it’s from one of the Star Wars movies, as it looks like he’s using the force. Hands on the keyboard is just so passe. This is an epic hacking fail. Instead of encrypting people’s computers with ransomware, this hacker has encrypted his own face! With artificial intelligence, the hackers of the future will be robots. Pull off the mask, and below is what future hackers look like from the inside. This reminds me of opening up my old Apple IIe from the 1980s. Here’s a future hacker at work. I don’t know why a robot hacker needs to wear these odd glasses, but there’s a lot about the future I don’t yet understand. This robot hacker seems to have no need for glasses with his laser eyes. I just love the lipstick! Also, it appears that his body is a tripod — part of the very sophisticated way that this hacker has been assembled. Behold the future of hacking! And the future is nigh upon us. Can we turn back? Can we prevent this dystopia? Alas, probably not. The hackers are now evolving beyond out control. Sorry to break it you, but we’re doomed . . . Professor Solove is the organizer, along with Paul Schwartz of the Privacy + Security Forum (Oct. 3-5, 2018 in Washington, DC), an annual event that aims to bridge the silos between privacy and security.